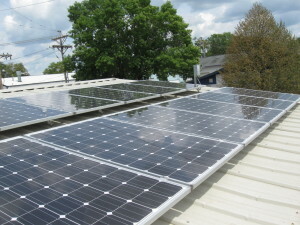 In order to demonstrate the current solar power technologies available, IEA has installed a 3 KW Solar Power installation at one of its facilities in Marion, Iowa. In addition to demonstrating the technology, IEA was interested in reducing its ongoing energy expenses at this location. The site was already on a Time of Day metering system with our utility supplier. On this program, electric energy consumed at off peak hours, nights and weekends, is billed at a 40% discount to normal tariff rates. However, energy consumed during the daytime hours is billed at a 40% penalty to normal rates. This particular location houses four of IEA’s diesel generators and is normally not staffed. Since the primary use of electricity at this location is to power the jacket water heaters for the engines, these heaters have been placed on timers to operate them primarily during off peak hours. The interconnection agreement between IEA and our utility supplier permits us to generate excess energy into the utility distribution system when we do not need it. Our utility meter keeps track of this excess energy and then credits it back to our account when it is ultimately used. This process is called Net Metering. The solar power installation obviously generates its energy during the daylight hours, when little energy is being consumed in our building. Since a considerable amount of energy is needed at night to power the engine jacket water heaters, we are able to utilize our net-metered solar power at night. This arrangement has worked out very well. Thus far, this system has generated nearly 3,000 kilowatt hours of energy and, according to the manufacturer, represents a reduction of 4,000 pounds of carbon emissions to the environment. Our system is equipped with an Internet connection so that we can monitor its production. It is interesting to watch the ups and downs of production as clouds come and go….or a sunny day versus an overcast one. We learned that it does not take much snow on the modules in the winter to cause them to cease production. Bird’s Eye view of IEA’s 3KW solar installation.